Those hems are buried in icing! Love it. 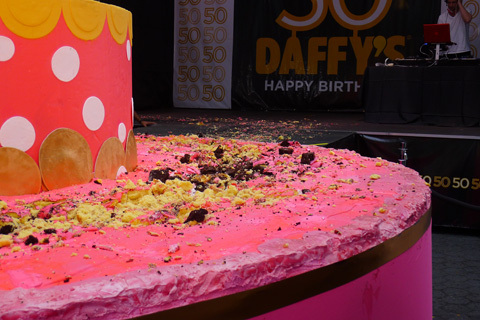 Last week was Daffy's 50th Anniversary party, and they celebrated in Greeley Square with a runway cake. No joke, the models walked on icing maybe five inches thick, and not a single one slipped and fell. It was still a great show, anyway. What? Please, you know everyone at fashion shows love a good fall! It's the whole long skinny arms and legs flailing thing. The styling in this show was beautiful. I want this entire outfit. Those boots are so cute I'd take them post-icing runway walking. Photo courtesy of Daffy's. Seriously, though, I had a great time at the show. I've done some whack runway shows myself in the past (involving shopping mall food courts, really slobbery giant poodles, Wizard of Oz costumes, sparklers, bunnies, doggie accidents on the runway...the list goes on and on) but I never walked on icing. And I have to admit it, this show made me nostalgic. The Daffy's models worked it even towards the end of the show when the icing was a mess, like sidewalk curbs the day after it snows in New York City mess. I join many a devoted Daffy's fan when I say "Thank you for everything, Daffy's!" Greeley Square was packed, probably the highest attendance we've ever had for an event there, and that just speaks to the great love us New Yorkers have for Daffy's. Keep bringing us those fabulous shoes, leather vests, dog sweaters and long cashmere cardigans at your ridiculous low prices. Truly, Irving Shulman, the founder of Daffy Dan's Bargain Town, started a beautiful thing 50 years ago. It was a crush of Daffy's fans in Greeley Square.